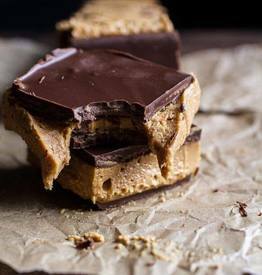 The amazing combo of chocolate and peanut butter simply never fails. Like never. Chocolate and peanut butter is my favorite combo, and basically, I just really needed a heavy dose. I kept things extra simple because really when you have chocolate and peanut butter together that’s all you need. No boat loads of sugar, eggs, flour and all the other stuff. Just a few basic ingredient, but mainly CHOCOLATE AND PEANUT BUTTER.